“It’s as close as you can get to a magic carpet ride,” says Roger Anderson, owner of Vista Balloon Adventures. The company, which is based out of Sportsman Airpark in Newberg, Ore., has seven balloons and offers one-hour flights over Yamhill County wine country between April and November each year. Flights are offered every day but Tuesdays, and the entire trip takes about three hours and includes a “sparkling” breakfast and complimentary souvenir to remind you of the trip. With seven balloons that can carry a combined 50 people, Anderson’s operation is so large that he has to skip balloon festivals in the area. He employs seven Federal Aviation Administration licensed pilots to captain his fleet. “Our balloons are too big, if we showed up no one else could land,” Anderson says. “Bungee jumping, white water rafting and skydiving are what I call ‘hard adventures,’ this is something that just about anyone can go and enjoy,” he says. Of course there are questions for those people who haven’t had the enjoyment of floating along enjoying a leisurely flight and sight-seeing. Anderson says when it comes to steering the balloon, you are largely at the whim of the wind – something he is used to as a former schooner captain. But you know what they say about flying, the most important part is the landing, and Anderson said that a hard landing should only feel like a jump off your front porch step. You shouldn’t even notice a good landing. He says that many of his trips during the summer the wind takes his balloons over the Willamette River where he does “splash and gos” where he lowers the balloon basket into the water, and then lifts it out. Anderson says the summer is the best bet for an elegant trip – early and late in the seasons he calls “mud season” so landings and breakfast can be a little messy. 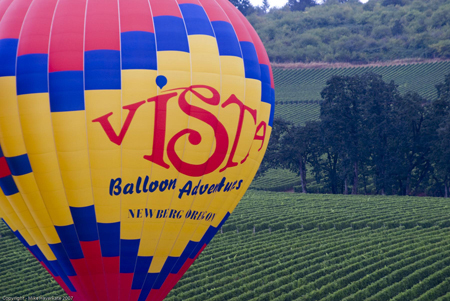 About the Vista Balloon Adventures: Based in Newberg’s Sportsman Airpark about 40 minutes from downtown Portland, this company offers one-hour flights over Oregon wine country – with the entire trip taking about three hours and including breakfast. Flights start at dusk, and are a great way to start a day of exploring Yamhill County. The company has been offering flights since 1989 and serve about 2500 to 3000 people per season. What to bring: Weather appropriate clothing, while the summer months are mild, in the beginning of the season in April and May and at the end of the season in October, Oregon can be rather wet and muddy. Wear footwear that will keep your feet dry and you won’t mind getting a little muddy. “Warm feet make happy fliers,” Anderson says. Another thing Anderson says he has seen over and over is people not charging their cameras before the trip. He does carry some batteries, but this is an hour flight that is very picturesque, so make sure you charge the batteries and clear off those memory cards! Getting there: From Interstate 5, take Tualatin exit # 289. (Page 685, 684, 714, 713, 743 Thomas Guide) This is the Tualatin-Sherwood Road. Go west on the Tualatin-Sherwood Road to Hwy 99W in Sherwood (approx. 5 miles.) Turn left on Hwy 99 W (south) and go about 9 miles into Newberg. Turn left at the THIRD stoplight onto Springbrook Rd and travel about a mile; Springbrook will curve and come to Highway 219. Go straight through the intersection, crossing over Hwy 219. Turn right at the stop sign onto East 9th, turn left on Commerce Parkway. Our parking lot is on the right next to Western Helicopter. 1. Wear shoes that will keep your feet dry and warm. 2. Wear weather appropriate clothing, remember you will be flying. 3. Make sure you charge your camera and have plenty of film or memory space. These are very beautiful flights and there will be a lot to take pictures of. Photos courtesy of Vista Balloon Adventures.